Happy May - Spring weather has arrrived! Hey friends, how are things going with you? As you may well know, spring and summer are my favourite times of the year. I hate the layers and shivering of the cold winter months, and the warmth and sunshine just makes me want to be outside all of the time! So I've been kinda absent for a little while, and it's because I've been partaking in a new hobby with my family. I say family but it's more my husband than the boys. A good friend of mine introduced me to something called geocaching, and if you're my friend on Facebook, you've likely seen some updates from me about it (sorry I went crazy on the finds that one day, the settings were messed up for FB!) So anyway, geocaching is a world-wide GPS treasure hunt. You probably have some right around where you are, yes, right now. I had no idea so many people were involved in this "secret", like, where have I been all my life? So, people take a little container, sometimes include a pencil and a log book, and if the container is big enough, you can exchange little dollar store trinkets when you find them. They hide the container, log the coordinates with the GPS system and it's put on a geocaching map. When you go to www.geocaching.com, and look at the map based on your current location, these coordinates pop up around you and you're on your way to the coolest couple of hours you've ever spent outside. So, back in December, when I gave my husband his Year of Dates, this activity was included, but not until June. We were on vacation in March, and went for a walk one day with the boys, and I decided to test it out. Devin was completely hooked, right from the start. We've found, at the present time, 21 geocaches in our area. We've gotten muddy and scraped, and we've scaled the side of the escarpment, (it can be dangerous at times!) but it's all in good fun, good exercise and it's just so darn awesome! If you're looking for some fun outside, definitely check this activity out. So, as you can see, I've not been spending a lot of time baking lately... No matter where we go, we're trying to find a geocache. We went to check out vehicles in Cayuga, and found two caches out there lol! We picked up our son where he was tagging for cadets, and found a cache. It's just too fun! 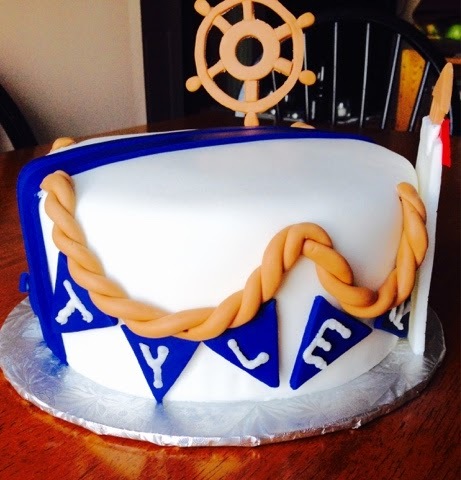 This awesome cake was a two-layer chocolate cake with vanilla buttercream and white, vanilla fondant. 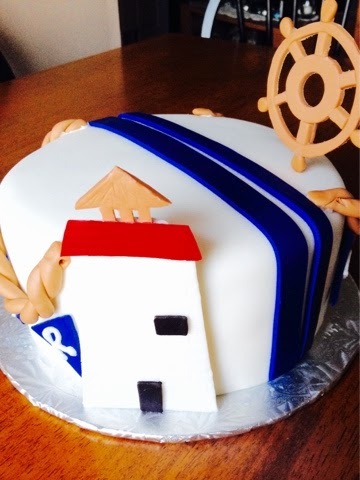 Two blue stripes and fondant rope decorate the top, and the elements included an anchor, a lighthouse and a ship's wheel. Tyler's name was spelled out on a banner underneath the rope. The rope was draped and secured in place with toothpicks and sugar-glue. SO fun to make this one, and it really didn't take too long, because my husband and I put the elements together two days before, to give them time to harden. With the craziness of the Christmas season, I've been taking it easy this month, not taking on so many orders, trying to get the rest of my life in order after the chaos. I've been hanging out with the family a lot, and just chilling out. We've been ice skating a few times, and we are really enjoying it! Since we aren't as active in the winter months as we are in the summer months, it's nice to get some physical activity in! Well, let's talk cake, shall we? 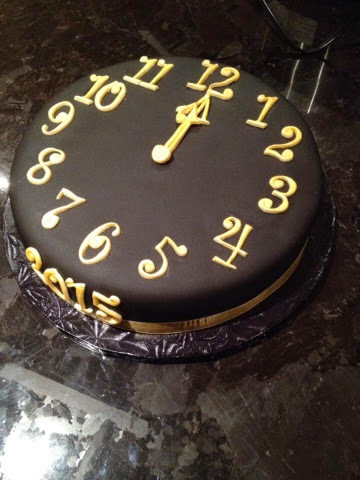 This elegant cake was what we delved into to start our New Year! It's a rich chocolate cake (of course!) with a strawberry jam filling, encased in delicious almond buttercream. Black fondant covers it, and yellow numbers were cut out using Curly Tappits. Then I mixed up gold luster dust with vodka and painted each number, coating it in gold. The same was done for the hands of the clock. Gold ribbon trimmed this beautiful cake. And of course, no one wanted to destroy it when it came time for dessert lol! 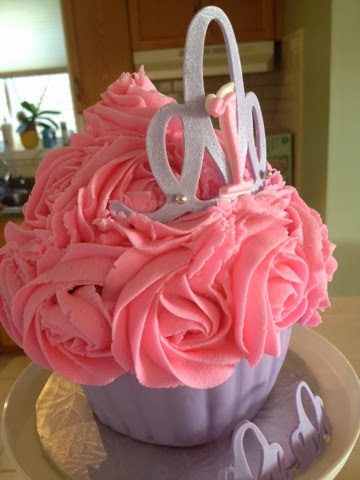 Next up was this cupcake cake for my neice. The party was Frozen-themed and I suggested doing the shape of a dress. You may have seen the one from Pinterest that is a wedding dress for a bridal shower? 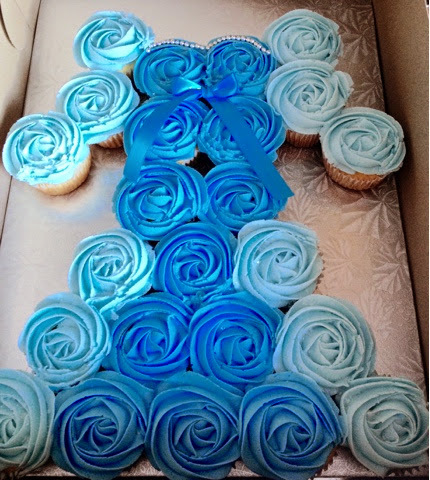 Same idea, but this one is topped with two shades of blue, like Elsa's dress, with some silver dragees along the neckline, a pretty ribbon in the center and it's nearly impossible to see them in this photo, but there are edible glitter snowflakes on the dress as well. A couple of co-workers and I were getting together with our significant others a couple of weeks ago, and we all brought something for the meal. I almost always bring dessert lol! So, I came across a recipe for eggless, butter and milk-free cake, and wanted to test out the recipe. The original recipe was for Kahlua but I had Bailey's on hand so I swapped it out. All I did was replace some of the liquid in the recipe for Bailey's. 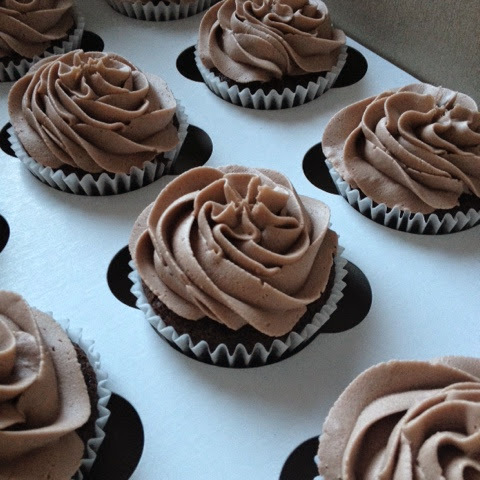 Did it ever smell amazing when I was baking these cupcakes! I am planning on being busy in the next couple of weeks, so I can't wait to write about Valentine's Day! December was such a busy month overall, with Christmas, but when you add a few cake orders to the mix, it is even busier! I loved every minute of it! How was your Christmas? Was Santa good to you and yours? Were you able to spend time with loved ones? I was so lucky to be around my three favourite people! My husband walked away a very happy man... he received a Bluetooth speaker, and something called a Chillsner, among other things, but I can't take credit for the idea, my sister-in-law suggested it at Thanksgiving. Still a brilliant idea. But the best gift I gave him was A Year of Dates. As you know, I am always perusing Pinterest, and I love the "25 Low-Cost Date Ideas" pins (or similar). So about a month and a half ago, I clicked on a pin which brought me here. I fell in love with her idea of a Year of Dates, and while browsing her amazing site, I came across, what I feel is a total gold mine, Friday We're in Love. WOW! I was so excited and even though I didn't want to share this amazing find, I did talk to a few friends about it. I got to work right away, and made my list of dates for the year. Making the envelopes was a little time-consuming, but so fun. It felt like I had this secret, and it was so inspiring, browsing Camille and Jacob's blog. I had to write to her and tell her how much I was enjoying it, especially as a someone married for 17 years! I told her I would share her amazing ideas, but not right away (partially because my husband reads all my blog entries and I didn't want to ruin the surprise!) And for the record, he was very happy with the gift.. I even let him open January's envelope and we're lookng forward to going to dinner and the movies next month! I am super excited about June's date... it's something we have never done before! Thank you, again, Camille! Next up is New Year's Eve! I am always excited about New Year's Eve/Day. For me, it feels like a fresh slate, a new start. It helps that it's officially vacation-planning month (although I already have my vacation requests turned in... lol!). I like that I get to reflect on the past year, and make plans for the upcoming year, even though I kinda started that before Christmas! We are going to a party and I'm bringing cake! I am taking Friday off as a personal day, so I get to enjoy two four-day weekends! Okay, so let's talk cake! As I mentioned, December was pretty busy for me, on top of preparing for Christmas, but it was well worth it! I started the month preparing for Elmo! This vanilla, two-layer cake with vanilla buttercream was a delight to make, because I was able to play with M&Ms! 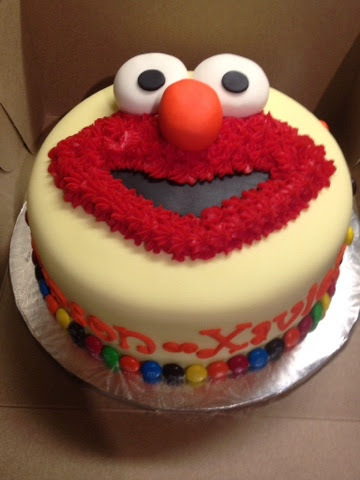 I've made a cake similar to this before, so making Elmo's face was easier the second time around. 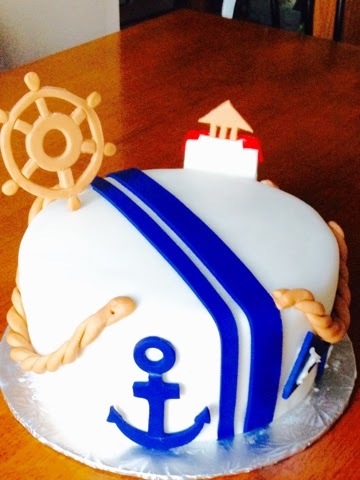 I hemmed and hawed about this cake for two weeks before making it... 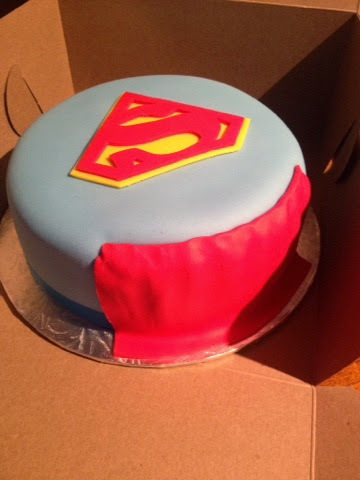 I was asked to make a Superman cake, and I really wanted to make a fondant figurine of Superman, but with a second cake due the same weekend, I knew I was crunched for time. I saw cakes on Pinterest with the cape, and wasn't convinced this was the way to go until my husband suggested it. And that logo? Yep, my husband made that! He did an amazing job, didn't he? I couldn't have made it that well! Another two layer vanilla cake, but with almond buttercream. And the little superhero recipient was thrilled! He LOVED the cape! 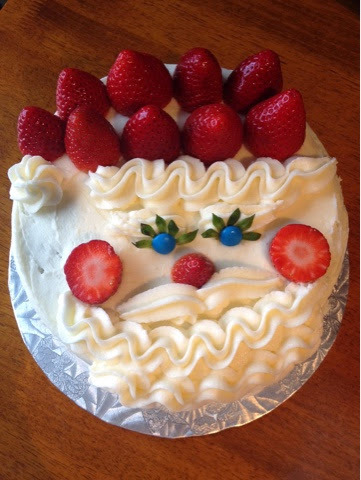 I made this adorable Santa cake for my husband's family's Christmas dinner. I tried a new recipe for frosting, which included sour cream. I can't say I was overall impressed with the taste, I really do think it was overly sweet. But hey, we have to try new things sometimes, right? This was a two-layer chocolate cake with sour cream vanilla icing. The face just blows me away, it's too cute! So the story with these cupcakes is this: My husband always tells me how awesome I am and sometimes, I just have to prove him right... lol!!! His work was having a Christmas potluck and over dinner the night before (nothing like the last minute!! ), he told me that he wasn't participating. I asked why, and he said because he didn't have anything to bring. I couldn't help but be slightly irritated at the look he gave me when he said it because it's not MY potluck, why am I expected to make something for him, right? But, he didn't know that that cupcakes I baked before that conversation were in part for him to bring to the potluck, I had already planned it this way. Next year, honey, you are on your own.. love ya! 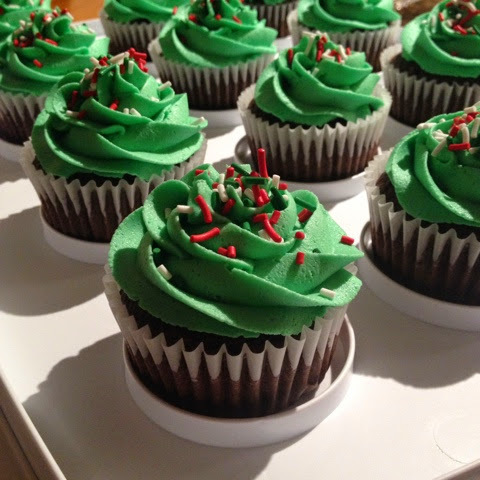 So I piped buttercream on them and put some Christmassy (is that a word?) sprinkles on top and stuck them in the freezer. He just assumed they were for our youngest son to take to school for his Christmas party. In reality, the other half of the cupcakes for Caleb's class weren't even decorated yet. Not wanting my son to bring in exactly the same cupcakes, I changed up the colouring and decorations on the cupcakes. This colour scheme, light blue and purple, always remind me of winter, and with the popularity of Frozen, it kinda jives with the movie. One of Caleb's classmates told him she didn't want one, until he mentioned they were "Frozen cupcakes", and she immediately scooped one up, lol! So that was the month of December for cakes in my little corner of the world. I meant to update the blog, several times, over the month but there just wasn't any time. One of my resolutions is to post more frequently this year... I need to make the time because I love to share my creations! January already has a couple of orders on the horizon, and I am super excited! And with that, I am signing off for the year... I'll be back next weekend to share my creation for the New Year's party with you all.. it'll be a surprise even for me, since I have no clue what to make yet! How was your weekend? Ours was great! We had family from Ottawa come and visit for the weekend, and we had a great time! Our oldest son, Tyler, was doing his thing for the Remembrance Day parade downtown this morning. As proud as I am of him, I am always more so when I see him in uniform! So, let's discuss the latest cake, shall we? 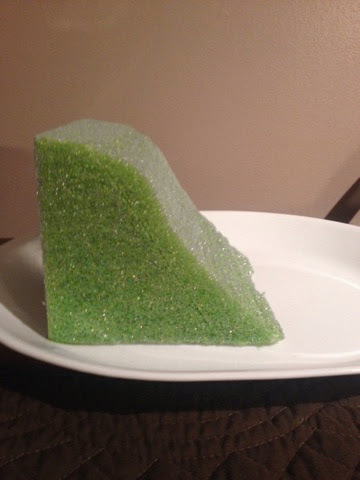 This process started a week ago, kind of, but I've been wanting to do this cake for a long time. It was supposed to be a birthday cake in February for one of our Ottawa guests, but plans fell through and we weren't able to get together. But the plan was always in the back of my mind! 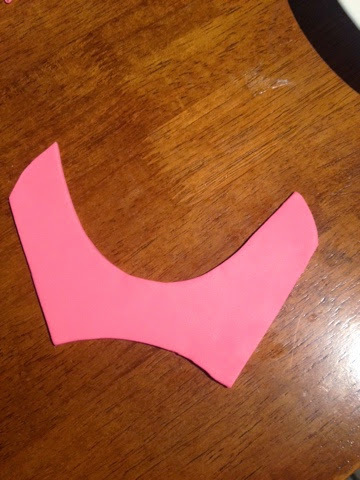 The first step, after cutting the fondant pieces of the shoe, was making some kind of support to let the pieces dry in the shape they needed to be in. 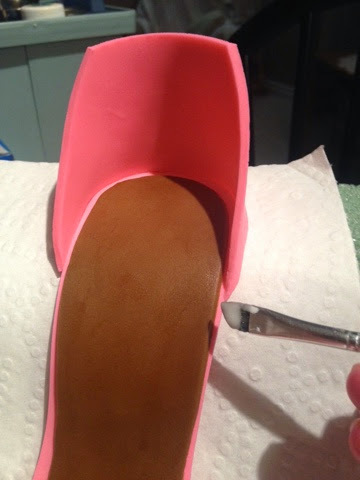 I bought a piece of foam and my husband cut it into the slope I needed, with the top being flatter so that the heel of the sole would dry flat and stay flush with the actual heel. I placed paper towel over it, to keep foam pieces from sticking on the fondant/gum paste piece. You could also use cling wrap, but I was afraid the bottom wouldn't dry properly. Next, was taking a ball of fondant/gum paste, about the same size as if you were making a large meatball, and working a log out of one end. This "stem" should be as long as you want the heel to be high... or, the same height as your sole support. It can be tricky to get this right (I still had to shave some of the heel off later to make it fit properly - trial and error). You may need to keep checking it against the height of the sole support and placing the heel part of the sole on the heel portion to test the waters. When this was done, I pushed a clean lollipop stick right through so it was sticking out of both ends. I inverted it so that the heavy end was on the bottom, and I pushed the stick portion into another piece of foam (covered in paper towel). I left both parts to dry for two days. Then I worked on the cake, which would become the shoe box. I baked a chocolate quarter slab cake, cooled it, and split it horizontally in half, and put a sheet of waxed paper in between the two halves, to keep them separate. Then I froze it. When I was satisfied that the sole was dried and firm enough, I decided to try attaching the very back onto the shoe. I mixed up some sugar glue (icing sugar and water), and attached the back. I love sugar glue because then I don't have to worry about the pieces falling apart so easily later, and, it doesn't take long to dry. The piece I was attaching was NOT dried... it was still pliable because I stored it in a ziplock bag until I was ready to use it. When it didn't seem like the pliable piece was going to crash and burn (lol), I felt confident enough to attach the very front. Doing this for the first time was a little daunting, I couldn't figure out which way was the right way, but it finally made sense to me, and I folded a paper towel to fit in between the sole and the piece I was attaching, for support. I let the pieces dry another day, and then I mixed up some brown coloured icing gel, and painted spots all over the shoe. I then used black to accent the brown spots and make it look like leopard print. I will not be doing this again withough using vodka in with the gel, because it wouldn't dry, but, on a positive note, the spots stayed shiny, even if they stayed wet. 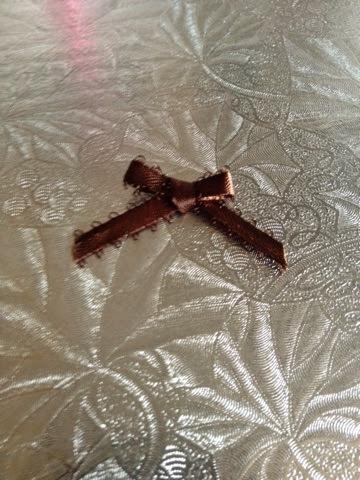 Then I made a little brown ribbon bow. I REALLY wanted to place it on the back, but because I knew I was using ribbon on the back to make straps, I thought it would be too busy, so I put it on the front. 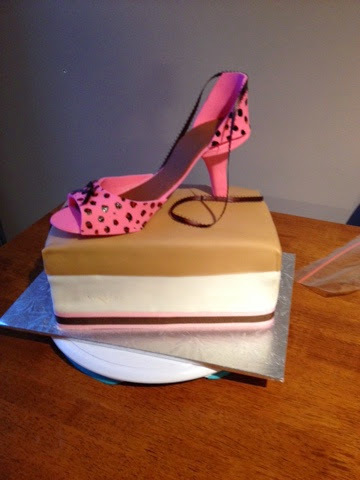 The cake itself, while it should have been the easiest part, It wasn't because when I took the cake out of the freezer to size it for the shoe (being the box, it needed to be the right dimensions to hold the shoe), I realized, one quarter slab wasn't gonna cut it. I was soooo unimpressed. Dinner, where I would be presenting the cake, was 2 1/2 hours away, and I still needed to cover the cake and put the shoe together, none of which I could actually DO, because I needed another quarter slab! So, I baked the cake, let it cool on the counter for ten minutes before putting it in the freezer for 15 minutes. It cooled substantially, and very quickly, considering, but this really set me back with my time frame. For me, there is nothing worse than icing a fresh cake. The crumbs are insane. I know it desn't matter when you bite into the cake, but heaven forbid you have to trim any sides (and I had to trim about an inch from each side), ugh, it was awful to try to make the buttercream stick. But I won! 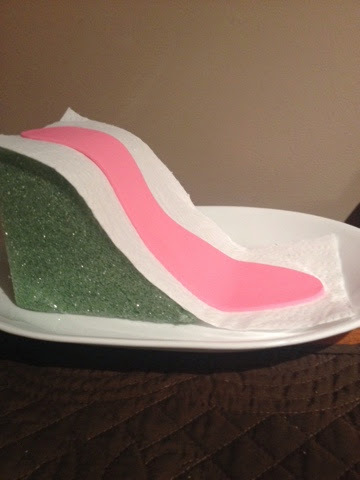 I got it covered, crumbs and all, and made an impressed four layers out of it, and it was the right size for the shoe! I tried to make the sizes as square as possible, but this would have been easier to do if both cakes had been frozen... lesson learned for next time! I used the instructions found here for the box itself. 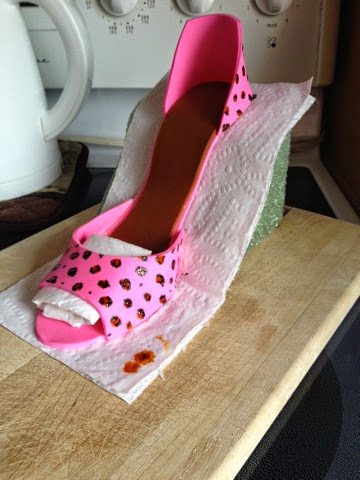 I didn't like the shoe here, it seemed like a cheater's way of doing it... but I loved the instructions for the shoe box, and it was actually fairly easy, just make sure you measure the fondant for the lid, and make sure the fondant is thick. Mine (the light brown fondant) was pretty thin, and it stretched when I rolled it on, so I needed to trim it again, carefully, once it was on the cake. The corners... I have to say.. AWESOME! I loved using the scissors to get that clean cut corner! This process needs to be done twice, once for the box itself, and again for the lid. I had my husband help me put the heel into the cake, after snipping off the lollipop stick protruding from the top of the heel part. 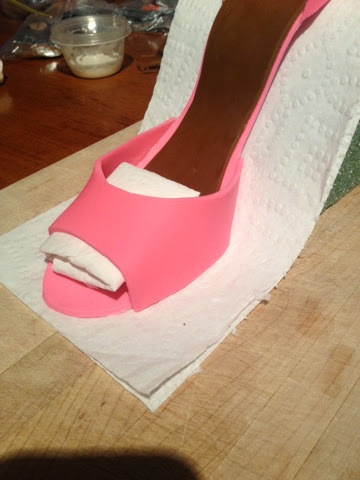 I used sugar glue to attach the two pieces, and more sugar glue to attach the front part of the sole to the shoe box (cake). There was so much more I wanted to do, but I ran out of time. 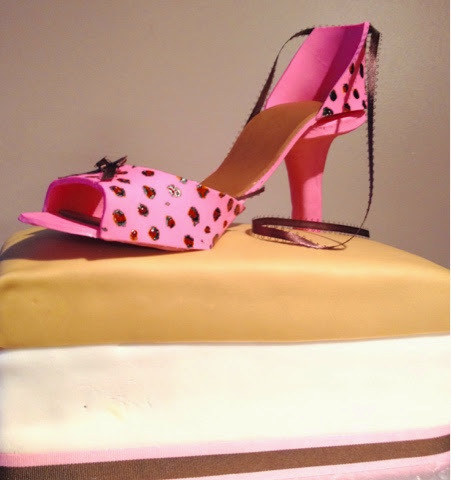 If it hadn't been for needing another cake, pronto, I wanted to decorate the box with some fondant cut outs from my Cricut Cake machine, and I wanted to paint the heel to match the rest of the shoe. I couldn't only do this part once the shoe was all attached and on top of the cake, because the gel would have smudged and made a huge mess. Woulda, coulda, shoulda. That's it, that's all, friends! Hope you enjoyed reading about this experience. I learned sooo much with this one! How was Halloween for you? Did you see a lot of Frozen characters? We got two Elsas and two Olafs... but it was pretty quiet overall in our little survey. I think the best costume I saw was a little boy, about two, MAYBE three. He had a Superman costume with a white dress shirt and black dress pants over top, with the shirt unbuttoned so you could see the Superman logo. He was Clark Kent! It was awesome! So I promised pictures, because my last post didn't have any... in truth, I was still working on a cake, and didn't have time to finish it before the trick-or-treaters came to visit us! I was really busy last week in the kitchen, baking up all kinds of cupcakes. 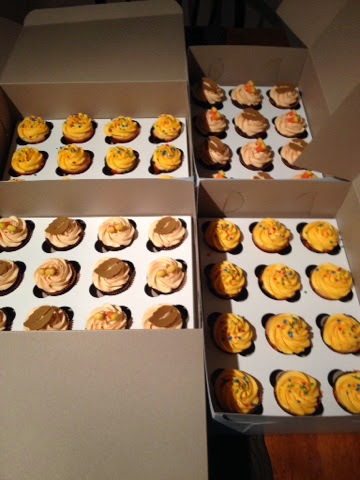 My youngest son was going to bring in two dozen cupcakes for his class party, and my husband and I were each going to bring in a dozen to work. 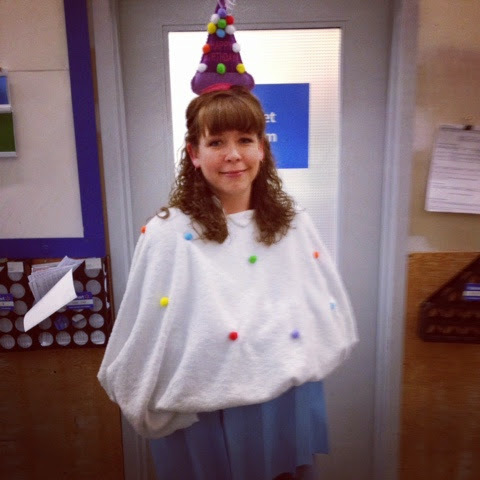 Plus I had to finish my amazing costume for work. 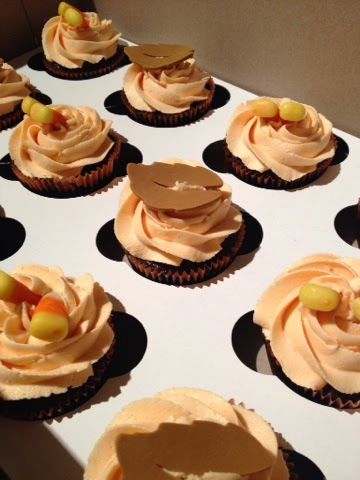 I did vanilla with vanilla buttercream for Caleb's class, and chocolate with caramel buttercream for work. They were all well-received! And lastly, the Halloween masterpiece. This one was another fun cake to do! It's a 9x13 cake, cut into three sections and stacked and iced in vanilla buttercream. I used more buttercream to build up the face in certain areas, and dug cavities for the eye and nose sockets. 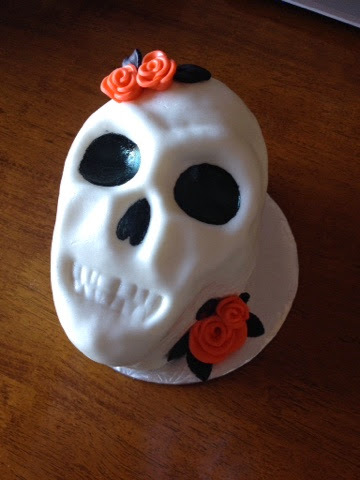 Then I draped white fondant over top, and continued to work the shape of the skull by hand. I refrigerated it overnight, to keep it firm. The next morning, I rolled out some neon orange fondant, and made roses, a couple of large ones, and a few smaller ones. I added some black fondant leaves to add to the Halloween theme of the cake. I used black icing gel to paint the eye and nose sockets and used a fondant tool to score the teeth into the fondant. There aren't many tutorials out there to show how to do a 3D skull cake, so please, if you have questions, let me know! This was not my first try with it, it can be tricky (no pun intended!) 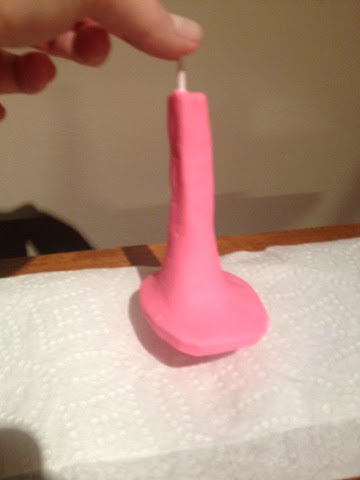 to manipulate the shape right... but it was well worth the effort, I think! I'm sitting here, sipping some well-deserved wine after a very busy night... Pinterest just might do me in one day! I had a co-worker save her empty milk jugs for me (she shops for groceries in the US), because I saw an idea on Pinterest where you draw a face on them, fill them with water, and then put a glow stick inside of them. Now, you and I know, not all Pinterest ideas work (I learned this after reading about one woman trying the "sugar spray" hair straightener and how much of a hassle she had trying to comb all the knots out of her hair, which is good and bad for me... bad because I wanted to believe something so cheap and easy could straighten my curly hair, and good because what she went through would totally be MY luck... thank goodness she saved me the hassle lol!). So anyway, back to my jugs.. lol! As I was breaking the glow stick, I half-wondered if it would work. But, lo and behold, we turned out the lights and it glowed like crazy! My husband was soooo impressed. We had six of them, and he designed them all.. but became stumped when he got to the last one. He told me he was trying to come up with an idea, and the movie, Saw, came to my mind... I think it was one of the best ones! You can see it on my new Instagram feed on this page. Anyway, after all that was done, I wanted to put my costume together for work, thinking it wouldn't take too long... yeah, no. Two heads are definitely better than one though, because I'm not sure I could have done it without my husband. When it was all said and done, it turned out AWESOME! He was laughing so hard, because of how well it turned out! (I'm telling myself that's what it was, and I'm sticking to it!) It was pretty cheap to make, with a trip to the dollar store! And all of this was while our oldest son was helping out at his high school Halloween dance. Have I mentioned we're a busy family? Because wine. Am I right? I did try another project, but I'm not sure how it will turn out.. it's on the small side, because it's more of a trial than anything else... once I master it, I'm sure I can do a much better job. If it doesn't turn out, you won't even see it, but if it's halfway decent, I just might let you see it lol! And in one week, a cousin of ours is heading out from Ottawa (the same one we visited in July), and I'm making her a LONG-belated birthday cake. Her birthday is in March, and she was going to come out for a visit then, but it didn't pan out, and I was a tad disappointed because I knew what I wanted to make for her. But I tucked the idea away and decided the opportunity would present itself. And now it has. This cake is going to be a lot of work, and I know I can rock it! Stay tuned... I think a lot of my friends will be impressed... heck.. *I* will be impressed! Have a safe and happy Halloween.. and I will post pictures soon! but, I've noticed a big difference in the popularity of "girl cakes" to "boy cakes". Boys need cake too... it's not just a girl thing, right? My boys need cake, for sure! They make sure to let me know this at every available opportunity, and if it's not being made for them, oooh the drama! Being a mom of two boys, it's both surprising and not so surprising. Not so surprising because I started noticing a trend about 14 years ago when shopping for clothes for my oldest son when he was six months old. The girls' department had three, jam-packed aisles of pretty dresses, frills and lace, tops, skirts, jeans and pants... the selection was just astounding! Me, I head over to the boys' "department" and I'm greeted with one SIDE of an aisle, with some pants and shirts, and if I was lucky, they came in different colours! I guess, like clothes, people love seeing the pink and frilly on cakes! I just think it's amusing to see the difference in how popular certain cakes are on my FB page. People will always surprise you. 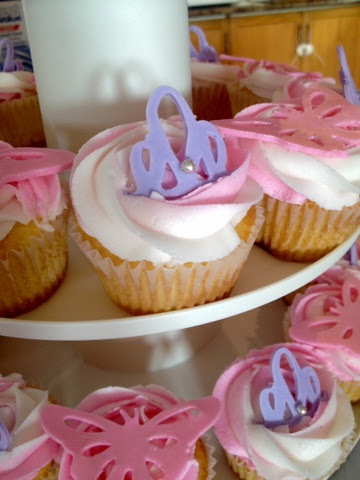 A recent cake that was very well received was a princess-themed giant cupcake cake, with standard cupcakes. This cake was fun to do because I finally cracked open my Cricut Cake machine. I bought this machine awhile ago but I think I was somewhat scared to use it. Yes, I loved the possibilities! 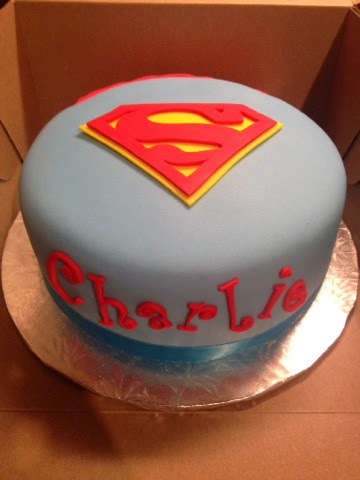 But, my patience only goes so far, so when I heard that sometimes the machine jams when cutting the fondant, I was hesitant, because I have enough issues at times! LOL!! I'm, by no means, a pro at it now, but it was fairly easy to use, and it really saved me some time. 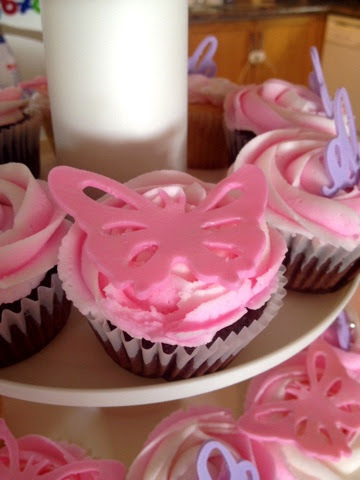 I love fondant cut-out toppers for cupcakes! And I wanted to be sure that there was one for every cupcake, so this was perfect, and did all the work for me. I also cut out two different "crowns" using patterns on the machine. I wanted to do two, so that in the event of one breaking, I'd have a backup. But as usual, when you have a back-up, everything turns out fine, so I'm really glad I did it! 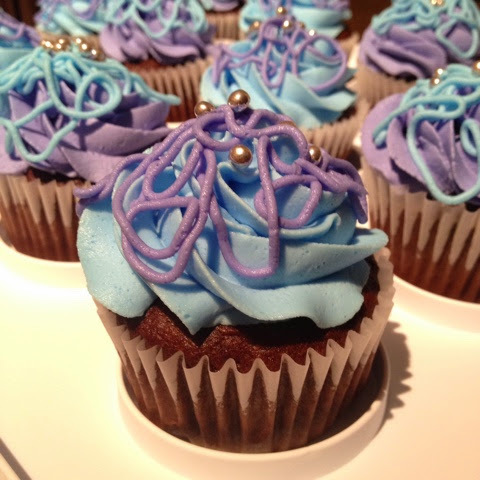 I used two colours of icing in the piping bag for the cupcakes and I was quite happy with the effect! Some silver dragees were attached with sugar glue on all of the crowns. The little girl (my niece) thoroughly enjoyed getting her hands dirty with the giant cupcake cake! What kinds of cakes interest you, and make you drool? Is it more about decorating, or the flavour that does you in? Stay tuned for some scary treats coming up later this week in time for Halloween! I'll be making some cupcakes for my youngest son to take to school, and a special family treat that I wasn't going to make, but the challenge is just too great! In the meantime, stay sweet!